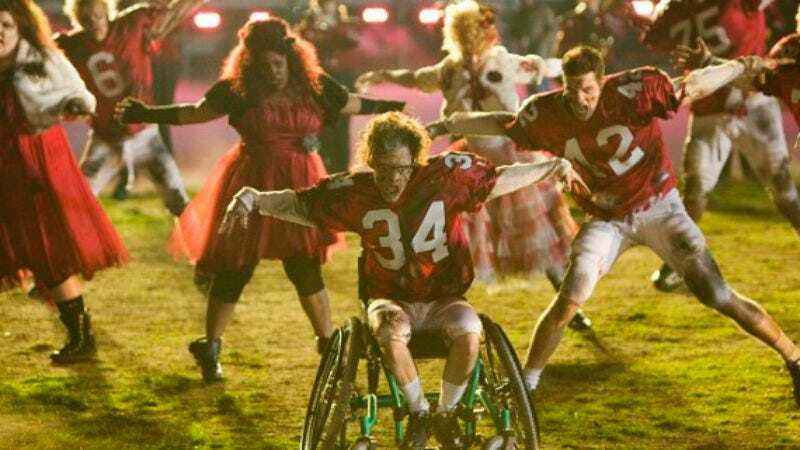 Glee: "The Sue Sylvester Shuffle"
The most people who will ever watch Glee probably watched Glee tonight. Now, a good number of them probably just had it on while they cleaned up after parties or to have background noise or for some other reason. So it’s a sure bet that a lot of these people didn’t really bother to pay attention to what was going on onscreen. But for the other portion of the audience, there’s really nothing to help take a show’s audience up into the stratosphere (at least for a little while) like a Super Bowl boost. It worked for Grey’s Anatomy, and it could, conceivably, work for Glee, too. So this episode needed not to be a Glee primer, not really, but a restatement of what the show is best at, an episode that made viewers excited to sit down and watch another episode of Glee on Tuesday, thus taking the series from one level of popularity to the next. Now, I’ve said a number of times that Glee can afford to be terrible. Part of the fun of watching it is its very inconsistency. It can also be terrific, when it wants to be (though that seems to be happening a lot less often, as of late). And the show didn’t have a tremendously high bar to clear with this episode. It just needed to be a super-spectacular that was better than both of this season’s other big spectacle episodes (the Britney one and the Rocky Horror one), while offering a very quick introduction to all of the characters and who they are. If it skewed a little heavily toward trying to rope in new fans, rather than appealing to the ones who’ve been with the show from the start, well, that would be forgivable. Better, the Black-Eyed Peas put on such a terrible Super Bowl halftime show that pretty much anything the show did was going to seem better by comparison. The bar was so low, the show pretty much just had to step over it. Did it? Mostly, yes. But in the process, it became the one thing Glee must never, ever be: boring. Strangely, outside of a handful of terrific episodes near this season’s start (including the season premiere and the essential “Duets”), the show has mostly been vacillating between bad episodes and episodes that stay so safe that they make the show feel like a shadow of its best self. Glee has been too boring for too long now, to the point where I wonder if what kills the show won’t be its love of having the characters do whatever the hell the writers need them to do to advance the plot but, rather, the fact that the show seems to have exhausted all possible plot ideas and is now simply spinning its wheels in an attempt to keep grinding out the season. But the rest of the episode was a curious mish-mash of things that should have worked but didn’t, things that never could have worked, and the show tossing Kurt into a couple of scenes because, hey, he’s a character. Strong plotting has never been this show’s best point, but the best episodes of Glee have a plot that more or less makes EMOTIONAL sense, playing off of things we feel to be true, rather than things we know to be true. And the nuggets of the plots here sort of work on that level. Sue wanting to fire Brittany out of a cannon works better than the A-plot because, well, it’s Sue and Brittany, and tossing those two into a Looney Toons type of scenario makes a certain amount of sense. But it was mostly just an excuse to do a bunch of Sue and Brittany gags and eventually have the Cheerios quit, over Sue threatening Brittany’s life. It more or less worked, I guess, but it wasn’t much of a story all the same, and it was missing the kind of cataclysmic conclusion that the best Glee storylines have, ending on more of a whimper (though I doubt we’ve seen the last of this). The other storyline pivoted, however, on one of the show’s weakest elements: its cardboard cutout understanding of high school cliques. Because that’s how things started out, the series feels the intense need to always reduce everything to a certain base level set of character interactions. The glee club is always uncool. The football team is always the top of the heap. The various groups within the school are pushed into conflict—occasionally by their overseers—because that’s what the groups need to do. The people within those groups can be nuanced (particularly the kids we’ve spent all this time getting to know), but the group dynamics themselves must always retreat to this basic setup. I get that certain kids are always picked on in high school. I get that Glee is all about giving those kids a voice and pairing them up with the more traditionally popular kids in a sort of alternate universe high school fantasy, where Artie can be on the football team AND date Tina, then Brittany. That’s obviously a big part of its appeal, and the hyper-earnest idea that anybody can build a place where they feel at home with their friends is a good one. I mean that. But at this point, the idea that the other cliques are always going to hate the glee kids for reasons that seem increasingly unfathomable is very weak. Most of these kids have spread out to make friends from other places in the school. The glee club has proved to be as inclusive and tolerant a high school institution as has ever existed. What’s more, the idea that the club would drag Quinn and Finn’s popularity down, or make Puck something of a pariah, has always been fairly unbelievable, and the show hasn’t done much to sell it. (Let’s pause for a moment to give Cory Monteith some praise, though, since he was asked to do a lot of difficult things in this episode, in regards to selling the idea of Finn as a leader, bringing disparate groups together, and he mostly managed that task, much better than he has in past episodes.) Here, the groups are in conflict, just because they have to be in conflict to make the ending work. And that makes the heightened emotions that should make the ending work mostly fall flat. These football players aren’t real characters. Outside of Karofsky, they’re one-dimensional cartoons who just do whatever they need to do for the plot to work that week, bogeymen with slushies. To a degree, this lack of reality is a part of the show’s appeal. I get that. I, for example, don’t care if the show violates the rules of football within its own fictional universe because, what the hell, you know? It’s an insane musical. The show has never followed the rules of football before, so it’s fine if it wants to continue its anything goes approach to the game, particularly if it results in such insanely strange visuals as the girls joining the team and Rachel’s face lighting up when she gets to wear number one. And I like the idea of Sue as this constant antagonist, stalking the halls of high school and trying to push people against the glee club for no real reason, “O Fortuna” always immediately restarting when she enters a room. The things about the show that put it in line with classic sitcoms or with silly cartoons bother me less and less the more the show goes on. But the problem with hitting the reset button over and over is that you need to introduce some new tricks, and I’m not sure Glee has, not yet. The club members getting slushied has run out of whatever juice it once had as a joke (though maybe with Artie getting hit this time, the show will leave that gag behind). The endless attempts by Sue to stop the club have just turned into the same damn thing over and over again. The football team going into conflict with the club and Finn trying to play mediator is similarly old. The show keeps tossing the same elements into the hat and coming out with similar results, as though the only thing anybody’s putting any effort into are the musical numbers. I want the show to be daring. I want it to take its mass audience and try some truly moving things or some truly weird things or some truly funny things. I’d much rather watch a God-awful show than a mediocre one. Because that’s what Glee is threatening to turn into: a show capable of moments of startling emotional power that’s trapped in the shell of what it was over 20 episodes ago. I don’t think the show needs tons of character growth or continuing storylines to be good. But I do think it needs to try new things and push into new territory, rather than just resting on its laurels. I can’t possibly imagine anyone watching this episode who’d never seen the show before and getting what all of the fuss was about, outside of the mash-up and maybe a few of the wittier jokes (most from Brittany, who seems to be the one character the writers still enjoy writing gags for, though I also like the one football player who says what the audience is thinking). I can’t imagine watching this and just having to see what happens next. The one big cliffhanger—Finn and Quinn kissing—is something that hangs on an old story development we’ve done already. I still have high hopes that Glee can pull itself out of its malaise, but it’s going to need to shake things up somehow, and I just don’t see the impetus for that arriving any time soon. Other musical numbers: I was surprised by how weak and lifeless “California Gurls” was. Was there any reason for it to be there, other than to lure unsuspecting football fans in with hot chicks? And Rachel and Puck’s duet had pretty much nothing to do with anything and didn’t even bother to suggest itself as a reason for the football players to become convinced this temporary glee club assignment was a good idea at all. I do like when the show indulges in a little self-criticism. Sue asking whether everything was empty spectacle now, whether she was right to be bored by it, felt a little like the writers needling themselves. I also like Coach Beiste because she’s one of the few characters who seems to grasp how insane some of this is. I always like when a show that frequently goes over the top introduces someone who’s able to undercut some of that ridiculousness. Kurt and Blaine were mostly in the episode to sing a song. I have to imagine viewers newly tuning in were wondering what the hell was going on when we dropped into Tolerance Narnia so abruptly like that. Dunno if you saw, but I interviewed Ian Brennan a couple of weeks ago, mostly about the process that goes into making the show. Suffice it to say that he contradicts some of the original tenets of the Three Glees theory (including the idea that he’s the “heart” of the show and the idea that anyone has ever written a script without input from the other two), but some of his answers also seem to confirm other parts of it (such as the idea that certain characters and storylines are handled by one of the three in particular). Given other things Ryan Murphy has said in the past (particularly about writing more heavily when the show has a special guest FOR that guest), I guess I’d say my working idea of some of the show’s chaos (which can be productive!) is that the show struggles for having three strong voices tugging it in different directions at all times, without one of those voices having a clear lead over the others. The show’s worst AND best episodes are the ones where one of the three aspects of the show’s personality—weird stuff, outright comedy, earnest drama—takes precedent over the other two. The blandest are the ones where everything gets mixed together in equal proportions. Unlike with, say, The West Wing, where the show had an equally small writing staff, but Aaron Sorkin was CLEARLY in control, the show desperately needs someone to just take it by the horns and make it what he wants it to be. That said, I promise to stop talking about it so much in the body of the reviews, since some of you complain about it! "You aren't gonna try and kiss me again, are you?" "If I have to stay, I'm not singing no show tunes. That is the music of my oppressors!" "Charity's my cat. She totaled my SUV last weekend." "I don't wanna die yet. At least not until One Tree Hill gets canceled." "The risk and danger isn't to you!" "That's the best part." "Who's the Yeah Yeah Yeahs?" "It's like a double rainbow. A zombie double rainbow." "I'm torn." "Well, I'm not." "I'm Brittany."